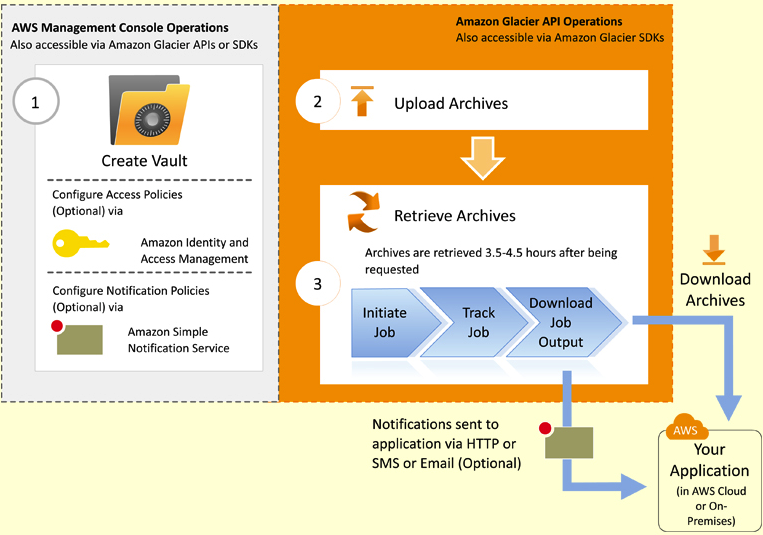 If you haven’t heard of Amazon Glacier, you need to check it out. As its name implies, you can think of Glacier as “frozen” storage. When considering the speed of EBS and S3, Glacier by comparison moves glacially slow. Consider Glacier as essentially a cloud-based archival solution that works similarly to old-style tape backup. In the past, backups first ran to tape, then were stored locally in case of immediate access requirements, and were then taken off-site once a certain date requirement was met (once a week, once a month, etc.). Glacier essentially works as the last stage of that process. When a snapshot in S3, for instance, gets to be a month old, you can instruct AWS to automatically move that object to Glacier. Writing it to Glacier happens pretty much immediately, though being able to see that object on your Glacier management console can take between 3-5 hours. If you need it back, you’ll issue a request, but that can take up to 24 hours to be resolved. Amazon hasn’t released the exact mechanics of how they’re storing the data on their end, but large tape libraries are a good bet since they jive with one of Glacier’s best features: its price. That’s only $0.01 per gigabyte. Its second best feature is 11 nines worth of “durability” (which refers to data loss) and 4 nines worth of “reliability” (which refers to data availability). That’s 99.999999999% for those who like the visual. As you can see, the first step is to download the Glacier software development kit (SDK), which is available for Java or .NET. Once you’ve got that, you’ll need to create your vault. This is an easy step that starts with accessing your Glacier management console, selecting your service region (Glacier is automatically redundant across availability zones in your region, which is part of the reason for its high durability rating), naming your vault, and hitting the create button. I’m using the sandbox environment that comes with your AWS account to take these screen shots, so the region is pre-selected. In a live environment, this would be a drop-down menu providing you with region options. The vault is where you’ll store your objects, which equate to a single file, like a document or a photo. But instead of proceeding directly to vault creation from the screen above, be sure and set up your vault’s Amazon Simple Notification Service (SNS) parameters. Uploading and downloading documents is where it gets technical. Currently, the web-based console above doesn’t have tools for managing archive operations like you’d find with S3. Uploading, downloading, deleting or any other operation will require programming in whichever language for which you’ve downloaded the SDK. You can use the AWS Identity and Access Management (IAM) service to attach user permissions to vaults and manage billing through your Account interface, but everything else happens at the code level. However, there are third-party Glacier consoles out there that can handle much of the development stuff in the background while presenting you with a much simpler management interface, such as CloudBerry Explorer 3.6. We’re not going to run through code samples here, but Amazon has plenty of resources for this off its Sample Code & Libraries site. On the upside, while programming for Glacier operations is difficult for non-programmers, if you’ve got the skills, it provides a lot of flexibility in designing your own archive and backup processes. You can assign vaults to any of the various backup operations being run by your business and define your own archive schedules. Essentially, that means you can configure a hierarchical storage management (HSM) architecture that natively incorporates AWS. For example, imagine a typical server farm running in EC2. At the first tier, it’s using EBS for immediate, current data transactions, similar to a hard disk or SAN LUN. When files in your EBS store have been unused for a period of time or if you’ve scheduled them to move at a recurring time (like with server snapshots), those files can be automatically moved to S3. Access between your EC2 servers and S3 isn’t quite as fast as EBS, but it’s still a nearline return on data requests. Once those files have lived on S3 for a time, you can give them a time to live (TTL) parameter after which they are automatically archived on Glacier. It’ll take some programming work, but unlike with standard on-premises archival solutions, which are usually based on a proprietary architecture, using Java or .NET means you can configure your storage management any way you like – for different geographic locations, different departments, different applications, or even different kinds of data. And this kind of HSM design doesn’t have to be entirely cloud-based. 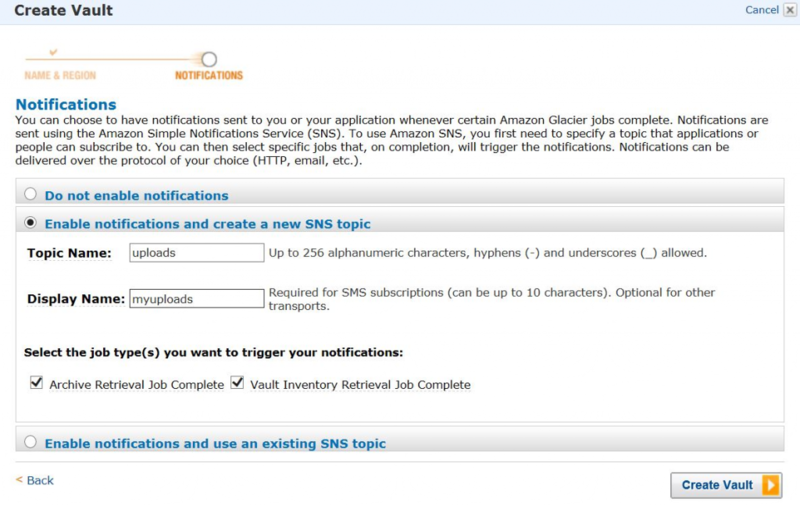 Glacier works just as well with on-premises data, applications, or server management. There is no minimum or maximum amount of data you can archive with Glacier, though individual archives can’t be less than 1 byte or larger than 40 terabytes. To help you observe regulatory compliance issues, Glacier uses secure protocols for data transfer and encrypts all data on the server side using key management and 256-bit encryption. Pricing is extremely low and simple to calculate. Data stored in Glacier is $0.01 per gigabyte. Upload and retrieval operations run only $0.05 per 1000 requests, and there is a pro-rated charge of $0.03 per gigabyte if you delete objects prior to 90 days of storage. Like everything else in AWS, Glacier is a powerful solution that provides highly customizable functionality for which you only pay for what you use. This service is definitely worth a very close look.